Summary: The Neuroform stent is the first microcatheter-delivered stent designed specifically for the treatment of cerebral aneurysms. The stent functions primarily to provide durable parent vessel protection during the embolization of broad-necked cerebral aneurysms. The present case report demonstrates in-stent stenosis occurring as a delayed complication of Neuroform stent-supported coil embolization of an unruptured cerebral aneurysm. In-stent restenosis represents a relatively common complication after the placement of intravascular stents for atheromatous disease, with a reported incidence of between 10–50% (1). This phenomenon is typically encountered within 3–6 months after stent placement. Although progression of atheromatous disease may contribute to in-stent stenosis, histologic studies have demonstrated that neointimal hyperplasia represents the primary pathologic mechanism in most cases (2, 3). The present case study provides an example of in-stent stenosis occurring 3 months after the placement of a Neuroform stent (Boston Scientific/Target Therapeutics, Freemont CA) to support the coil embolization of an unruptured right internal carotid artery (ICA) terminus aneurysm. A 69-year-old female patient was referred to our clinic for management of an incidental 9-mm right carotid terminis aneurysm that was initially diagnosed on the basis of MR imaging findings; MR imaging was performed for the evaluation of chronic headache. Findings were corroborated by conventional angiography. After a discussion of the management options—serial imaging follow-up, surgical clip placement, and endovascular coil embolization—and associated risks, the patient elected to proceed with coil embolization. In view of the anatomy of the aneurysm neck (Fig 1), the patient was pretreated for 1 week with aspirin 325 mg PO QD and clopidogril 75 mg PO QD to accommodate the possibility that a stent would be required to provide parent vessel protection during the embolization. 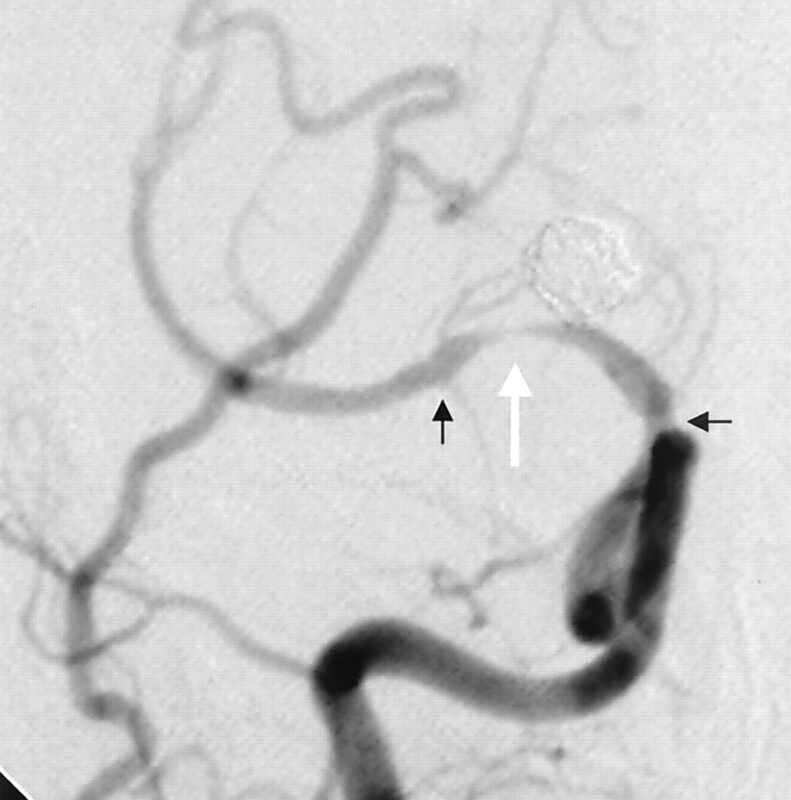 Right ICA angiogram depicting a 9-mm broad-based aneurysm arising from the right ICA terminus. Initial angiographic runs were performed to establish the optimal working angles and further delineate the anatomy of the aneurysm (Fig 1). An SL-10 microcatheter (Boston Scientific, Natick, MA) was then manipulated into the aneurysm over a Synchro-14 microguidewire (Boston Scientific). After a stable microcatheter position within the aneurysm was attained, primary coil embolization of the aneurysm was attempted. A Firm Matrix 3-D 8 mm × 25 cm coil (Boston Scientific) was introduced into the aneurysm. Despite multiple attempts at repositioning, however, the loops of the coil persistently prolapsed into the ICA terminis and M1 segment of the right MCA. This coil was then removed and the microcatheter was retracted back into the carotid terminis and then manipulated over the microguidewire into an M3 branch of the right middle cerebral artery (MCA). The microcatheter was then exchanged for a 3.5 mm × 20 mm Neuroform stent delivery system. The Neuroform stent was deployed such that the distal stent markers were positioned within the proximal M1 segment of the MCA and the proximal markers within the supraclinoid carotid artery, just proximal to the origin of the posterior communicating artery. The stent was easily and accurately deployed over the microwire without significant binding within the apparatus. The stent delivery system was then exchanged for the SL-10 microcatheter, which was subsequently manipulated into the aneurysm. Coil embolization was then initiated. A Matrix Firm 3-D 8 mm × 25 cm coil was used as the initial coil. An additional 61 cm of Matrix coils and a single 2 mm × 2 cm Guglielmi detachable ultrasoft coil (Boston Scientific) were deployed into the aneurysm. The final angiographic runs demonstrated near-complete occlusion of the aneurysm with minimal filling along the medial aspect of the aneurysm neck, the stent remained widely patent, and the stented segments of the ICA and MCA appeared smooth and without evidence of dissection or spasm (Fig 2). The patient emerged from general anesthesia neurologically intact and was discharged from the hospital the next day on aspirin and clopidogril. A, Unsubtracted image depicting a Neuroform stent positioned across the neck of the coiled right ICA terminis aneurysm with the proximal and distal ends of stent indicated by four radiopaque stent markers (arrows). B, Subtracted images from a right ICA angiogram demonstrating near-complete occlusion of the aneurysm with a small focus of residual filling along the medial aspect of the aneurysm neck. The radiopaque proximal and distal stent markers are faintly visualized as foci of subtraction artifact (arrows), terminating within the supraclinoid ICA and M1 segment of the MCA, respectively. The stent is widely patent and the stented segments of the parent vessels appear completely intact. Specifically, there is no evidence of dissection or vasospasm. The patient was seen 3 weeks after the procedure. Clopidigril was discontinued at that time, and the patient was maintained on daily aspirin (325 mg). Although still experiencing persistent headaches, she indicated no new neurologic complaints, and her examination was normal. Eight weeks after the procedure, she contacted our office with the complaint of a single episode of left body paresthesias that abated spontaneously after a few seconds. She experienced one additional similar episode 4 weeks later and an ultrashort TE MR angiography (MRA) sequence was performed for further evaluation. MRA demonstrated stenosis extending throughout the stented segments of the ICA and MCA with a focal flow gap within the proximal M1 segment of the right MCA. The patient was maintained on aspirin and restarted on clopidigril 75 mg PO QD. Conventional angiography performed the next week (13 weeks after the initial stent-supported coil embolization) confirmed in-stent stenosis with preocclusive stenosis involving the proximal M1 segment of the right MCA (Fig 3). In view of the severity of the stenosis and symptoms while on aspirin, angioplasty of the right MCA was performed. A 2 mm × 9 mm compliant Maverick balloon (Boston Scientific) was used to dilate the stenotic M1 segment with inflations performed over 3–5 minutes to a maximum pressure of 6 atmospheres. Postangioplasty control angiography demonstrated substantial improvement in the caliber of the M1 segment with mild residual stenosis (Fig 4). The patient emerged from general anesthesia intact, but 30 minutes later developed a severe right-sided headache. CT examination of the brain demonstrated a 7 × 3 cm parenchymal hematoma within the right cerebral hemisphere. Heparinization was reversed with protamine and platelet transfusions were initiated to counteract the antiplatelet medications. Over the next 4 days, the hematoma demonstrated gradual interval enlargement and the patient developed a mild left hemiparesis, left neflect, and left hemianopsia. The hematoma was evacuated, and the patient made an excellent functional recovery with only a residual left hemianopsia and was transferred to an inpatient neurorehabilitation floor. While in rehabilitation, the patient developed increased left hemiparesis and a left-sided facial droop. MR imaging demonstrated new areas of restricted diffusion within the right MCA territory. 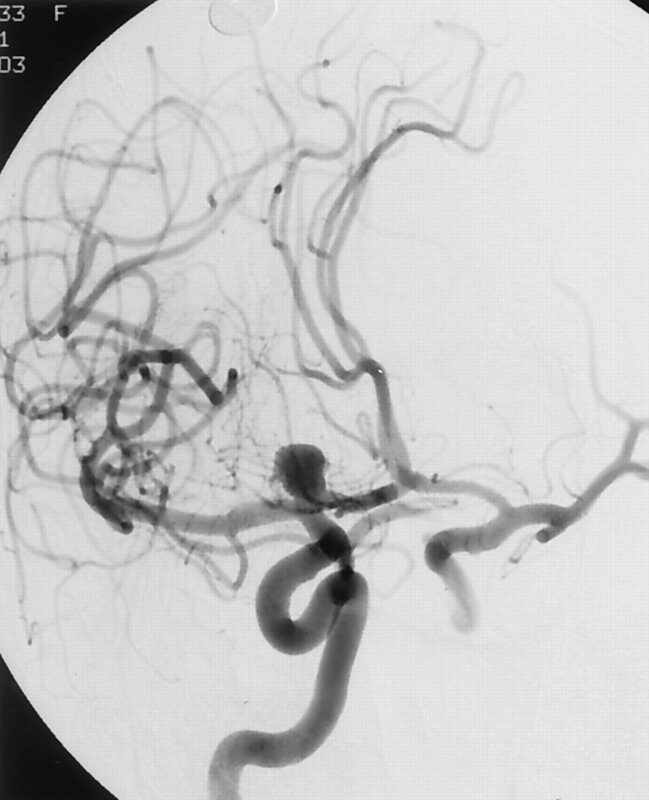 A subsequent CT perfusion examination with and one without acetazolamide demonstrated a cerebrovascular steal phenomenon within the right MCA territory. A superficial temporal artery (STA)-MCA bypass was performed to augment cerebral blood flow to the right hemisphere. Postoperative angiography demonstrated a patent STA-MCA bypass and progressive stenosis of the right MCA (Fig 5). Once again, the patient made an excellent functional recovery and was eventually discharged home on aspirin therapy. One month later, the patient experienced further progression of left hand and face weakness. Repeat MR imaging demonstrated additional regions of restricted diffusion within the left MCA distribution. She was fully heparinized and converted to warfarin adjusted to achieve an INR of between 2.0 and 3.0, and she was also continued on aspirin 325 mg PO QD. At discharge, the patient demonstrated a residual left hemiparesis, mild left neglect, and a left homonymous heminaopsia. After 5 months of the current anticoagulation regimen the patient has experienced no further right hemisphere ischemic symptoms. 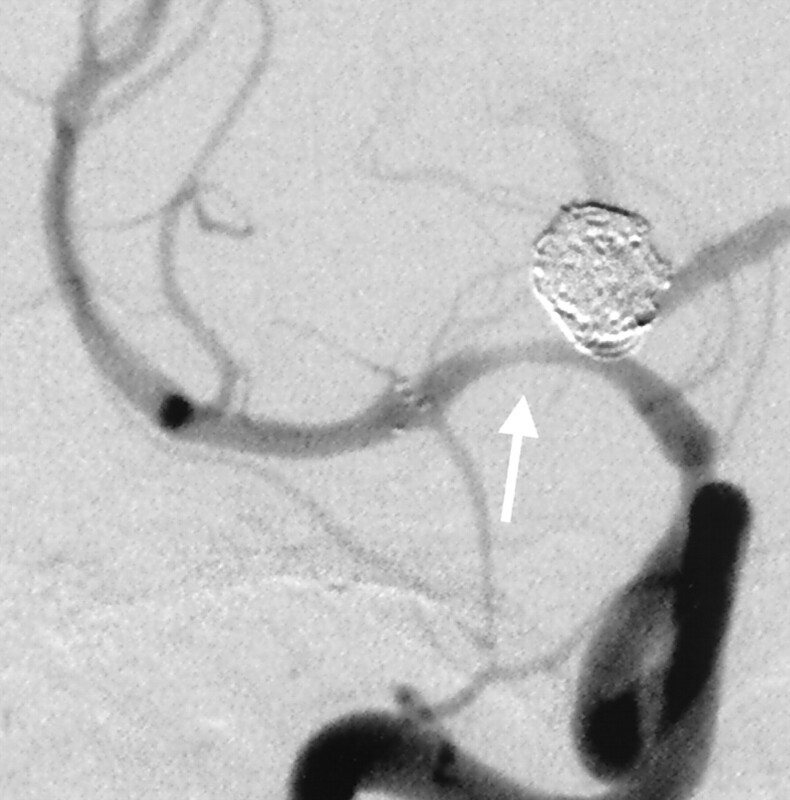 Right ICA cerebral angiogram demonstrating high-grade in-stent stenosis within the M1 segment of the right MCA, just distal to the carotid terminis (white arrow). There is also narrowing of the supraclinoid ICA, just adjacent to the proximal stent markers. The proximal and distal stent markers (black arrows) are not well visualized on this subtracted image. Postangioplasty control angiography demonstrating mild residual in-stent stenosis involving the M1 segment of the right MCA (arrow). The distal ICA stenosis is unchanged. Follow-up posteroanterior (A) and lateral (B) right common carotid angiogram demonstrates a patent STA-MCA bypass (white arrow). There has been marked interval progression of the stenosis within the proximal M1 segment of the right MCA (black arrow), which is now preocclusive. Most flow to the right MCA circulation is supplied from the bypass, minimal anterograde flow through the highly stenotic M1 segment was substantially delayed. The Neuroform stent is the first stent designed specifically for use in the cerebrovasculature to support aneurysm treatment (4). Before the availability of Neuroform, only balloon-expandable coronary stents were available for use as adjuncts for the treatment of cerebral aneurysms. Although these stents were not infrequently employed effectively (5, 6), their lack of flexibility made navigation through the tortuous cerebrovasculature difficult, and sometimes dangerous or technically impossible. The Neuroform stent, a Nitinol self-expanding stent delivered through a microcatheter, offers several substantial advantages over the preexisting balloon expandable coronary stents primarily related to the increased flexibility of the stent and delivery system, which allows safe negotiation and deployment within even the most tortuous segments of the cerebrovasculature. The availability of this tool facilitates the treatment of complex aneurysms, many of which would otherwise not be amenable to endovascular therapy. As a new device, there is limited knowledge of the long-term effects of the Neuroform stent on the cerebrovasculature. There is also limited data documenting the rate of stenosis within coronary stents deployed within the cerebrovasculature, particularly in cases in which stents are deployed for the treatment of aneurysms rather than atheromatous plaque. The largest available case series describing the fate of balloon expandable stents deployed within intracranial arteries documented three cases of delayed in-stent stenosis in 81 patients at a mean follow-up time of 5 months. All three patients with in-stent restenosis were initially stented for the treatment of stenotic atheromatous lesions. No cases of in-stent stenosis were reported in patients in whom stents were deployed solely for the treatment of aneurysms (5). Studies of stents deployed within the coronary circulation for atheromatous disease indicate a restenosis rate ranging between 10–50% depending on the characteristics of the patient, the lesion treated, and the interventional technique employed (7). Although in-stent restenosis represents an anticipated complication of stent placement for atheromatous disease in the peripheral vasculature, it would not intuitively follow that this experience would translate to the deployment of a self-expanding intracranial stent within a nonstenotic vessel for anerysm treatment. This is particularly true in view of the very low radial force of the Neuroform stent and correspondingly low likelihood of significant vessel wall trauma during and after deployment. Although the true incidence of in-stent stenosis after Neuroform stent placement will not be clear until a larger volume of follow-up data becomes available, the lack of any similar reports would suggest that it is likely to be quite rare in light of the fact that more than 1000 Neuroform stents have been deployed in the United States since October 2002 (Kevin Canady, product manager, Neuroform Stent, Boston Scientific/Target Therapeutics, personal communication, January 9, 2004). Restenosis of stents placed for atheromatous stenosis has been attributed primarily to the phenomenon of neointimal hyperplasia with or without superimposed progression of the primary atheromatous disease. Neointinal hyperplasia is histologically characterized by smooth muscle cell proliferation and excessive extracellular matrix production. This process typically peaks between 3 and 6 months and then stabilizes. In light of the complete absence of atheromatous disease within the stented vessel and the time course of the process, the current case most likely represents the sequela of “aggressive” neointimal hyperplasia. “Aggressive” in-stent restenosis has been introduced as a special subtype of in-stent restenosis characterized by involvement of longer segment of the vessel or more severe narrowing than the initial lesion. Unlike other forms of restenosis, the clinical course tends to be more malignant with higher rates of symptoms and, with respect to coronary stents, higher rates of myocardial infarction (8). The appearance of the vessel immediately following stent placement and the delayed nature of the patient’s symptoms militate against any acute intraprocedural complication, such as vessel injury or dissection. The use of Matrix coils in conjunction with the Neuroform stent raises the possibility of a synergistic effect of the two implants on neointimal proliferation. Matrix coils are platinum-based coils coated with a polyglycolic acid and lactide polymer. The polymer coating induces accelerated aneurysm thrombosis and neointima formation at the aneurysm neck (9). It is entirely conceivable that an exuberant reaction to the Matrix coils may have stimulated an unusually aggressive neointimal response to the stent. Until more follow-up data become available and the incidence of this phenomenon is better understood, no recommendation can be made at the current time with respect to the use of these two devices in combination. In-stent stenosis represents a potentially devastating delayed complication of Neuroform stent-supported aneurysm treatment. Although this likely represents a very rare event, additional follow-up data will be critical to delineate the incidence of this phenomenon. Accepted after revision February 18, 2004. Embolization of Acutely Ruptured and Unruptured Wide-Necked Cerebral Aneurysms Using the Neuroform2 Stent without Pretreatment with Antiplatelets: A Single Center Experience. In vitro studies of the neuroform microstent using transparent human intracranial arteries.